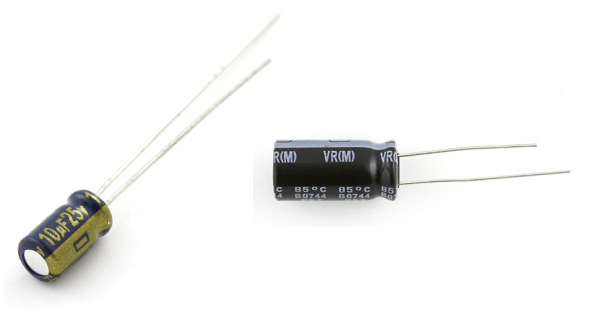 Not all capacitors are polarized, but when they are, it's very important not to mix their polarity up. 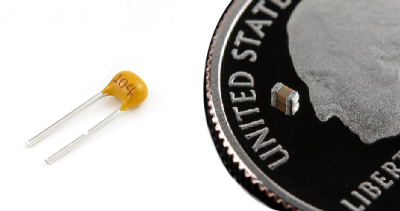 Ceramic capacitors -- the small (1µF and less), commonly yellow guys -- are not polarized. You can stick those in either way. Through-hole and SMD 0.1µF ceramic capacitors. These are NOT polarized. Electrolytic caps (they've got electrolytes), which look like little tin cans, are polarized. The negative pin of the cap is usually indicated by a "-" marking, and/or a colored strip along the can. They might also have a longer positive leg. Below are 10µF (left) and a 1mF electrolytic capacitors, each of which has a dash symbol to mark the negative leg, as well as a longer positive leg. Applying a negative voltage for an extended period to an electrolytic capacitor results in a briefly exciting, but catastrophic, failure. They'll make a pop, and the top of the cap will either swell or burst open. From then on the cap will be as good as dead, acting like a short circuit.